Congratulations – you took ownership of a digital enablement program. This is a big piece of the digital transformation efforts taking hold within your company! Perhaps you are about to lead a social selling effort? 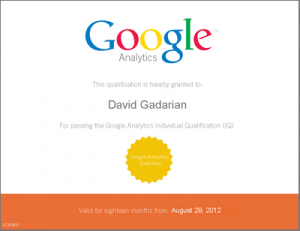 Or maybe it is more about training your content team around SEO? Or some other effort that involves spinning up people to adopt digitally-centric activities of some kind? This is a big scope that if done right will scale and deliver a big impact. In addition, you are likely involving multiple stakeholders. Some of whom might have only a passive familiarity with how the project will come together but will still have firm expectations around end results. After all, this is digital transformation we’re talking about! Sounds like a great project that will have all kinds of curves, unexpected turns and delicious pit stops along the way. Exactly the type of project you can sink your teeth into and really knock it out of the park. But where do you start? With a framework! In particular with a digital enablement framework that will be flexible where needed, and yet focused as required. And here it is: the digital enablement framework that I’ve used to help many folks and teams embrace digital transformation programs. Digital confidence is all about a comfort level. Understanding a domain or digital discipline to the point that it no longer scares you. With digital confidence you have a strong feel for what it is and how it works. Moving well past digital confidence, digital dexterity speaks to your ability to execute and deliver tangible, positive outcomes. This piece, digital gravity, embodies the highest level of achievement. Often to the point that as you deliver outcomes, the digital universe is actually gravitating into your orbit. You are literally able to attract and influence outcomes in a tangible way. It’s been my experience that there are a number of factors running across every digital enablement effort. Some factors are favorable (tailwinds), others are not favorable (headwinds). And some factors are simply chaotic realities that are there in all things digital (cross winds). These competing and complementary factors are the “digital soup.” Sometimes soup is delicious. Other times it can be a hot mess. The soup is always there. You know it. And so does everyone else. To the point that the soup has become something of office parlor game. And every office seems to play it. And now you have a choice. Either drown in the soup… or ensure that your digital enablement efforts remain focused and stay ahead of the soup. A key piece of your success will hinge on making sure that everyone is aware of the soup and and that nobody drowns in the soup. And of course, for those that get stuck in the soup, we have a great recovery plan in place. So what does this have to do with the framework? Well, it’s fairly easy, and intuitive. It comes down to communication. Literally by communicating what you are about to roll out, and how this will phase in, most people will be willing to ride the currents with you. The reason being that they can already align with where they’ll be next in the framework, with your help of course. And perhaps more importantly, you’ve now presented both your framework AND their journey. Now suddenly the soup is no longer a scaling hot mess, but rather a delectable meal that will be remembered fondly. In order to understand how best to implement this framework I’ve found it best to explore the digital enablement framework from a range of perspectives. These are the folks that pay you. And while they gave you the assignment (or maybe you pitched it to them!) they are not into free rides. They’ll expect you to deliver on time and often at scale. The digital enablement framework will help alleviate much of your early stage delivery pressure. Why you ask? Because by walking management through the framework (literally that one image) you can talk to scale, pace and ambition. If they want the details, don’t worry – you’ll have them (in your Curriculum). But more then likely management will be happy to see your framework and a Timeline as generally they are too busy to focus on the details and instead would rather concentrate on outcomes. These are the lucky recipients who are about to be beneficiaries of your digital enablement program. Often they are colleagues in various departments, but possibly they are clients. No matter. The digital enablement framework will delivery multiple assurances to this group. First, and perhaps most importantly, it will let everyone now that you are on top of the soup. The implication in the diagram is that most of the folks in the group are not yet digitally confident. Digital confidence will be the first team ambition. And by staging your program in this way, your users can see that already out of the gate the expectation is that they are likely at the very beginning. In addition, by using the framework you allow everyone to score themselves at the outset and also to have some aspiration goal. Finally, the framework, when presented properly, will allow all the users to visualize their growth journey. Having digital gravity is exciting, and frankly it sounds very cool. I’ve found that now that you’ve oriented your team in terms of a digital enablement journey, you can also use the same framework to help guide your program. Early “sessions” (could be a classroom format, via e-Learning or even email) should be focused on bringing people up to a level of digital confidence. The next portion of your curriculum is focused on taking those early skills that ultimately add up to to digital confidence and layers deeper skill sets on top. For many programs this could be a great end point which is something you’ll want to align with management on. 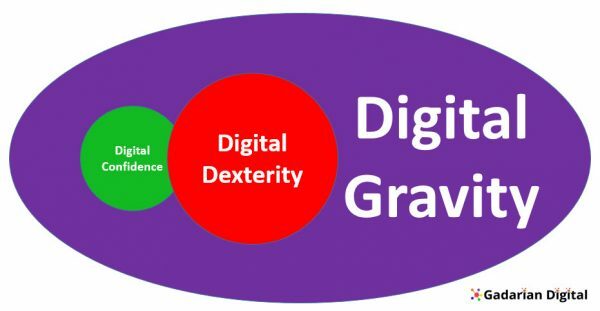 I’ve found that it can be helpful to provide folks with a solid exit ramp after the digital dexterity portion. By doing so, particularly if you introduce this potential for an exit ramp you’ll be managing expectations for all parties, and perhaps even more importantly you’ll be in a better position to bring as many folks up as possible. Of course if management expects everyone to be a black belt on the other side of your program you should not be introducing any parachute considerations. Use the framework to create a timeline, again tightly coordinated with your digital enablement curriculum. Don’t wimp out and not establish a timeline at the beginning. There are usually a ton of factors working hard to ensure that your project is a failure (you read the part about the soup right?). A timeline is a particularly useful device with management. If your project has a timeline and other competing factors are not time bound, more than likely your project will have more managerial support, and you never now when you’ll need it. Lastly, a timeline is only fair to all parties involved as it helps define expectations and also introduces goals. Any serious program focused on complex user efforts involving digital transformation should have very clear benchmarks defined in advance. The benchmarks might be behavioral, or maybe they are more qualitative (sorry but I can’t define this for you), but benchmarks should be tied to the framework in order to give all parties (users, management and you) and very clear view around what “good” looks like and also who close you are to the mark. And of course benchmarks are another key element you’ll need in order to have ongoing managerial support. Without agreed upon benchmarks you’ll have a hard time proving that your program is on track and successful. Management will generally frown upon things that cannot be measured. I’ve also found that benchmarks when well conceived of can deliver great acceleration to any program, particularly during the approach to digital confidence. So up till now we’ve really focused on everyone else, but to be clear, you have the most to gain from this digital enablement framework. By having a framework in place you are now able to have a clear dialogue with management and your users are on the same page as you. In addition with the framework you now have in place a clear path to developing and executing on all the critical details. Most importantly, you’ll have a much higher degree of confidence. So there you have it. A digital enablement framework to take you from the beginning through to completion.